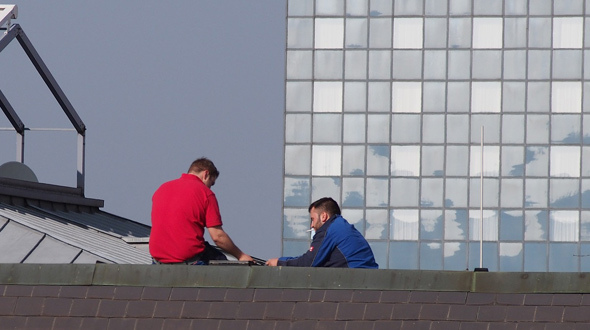 After a severe weather event, leaks in a commercial roof can become problematic very quickly. Besides disrupting business and making a mess, they can cause electrical problems, structural damage, and lead to roof failure if not promptly addressed. When the roof of your commercial building, hotel, office, warehouse, or retail location is damaged or develops a leak, it should be treated as an emergency and handled immediately. In this article, atlantacommercialroofingcontractors.com discusses weather-related roof damage, insurance company assessments, and how to hire a roofing contractor. During or after a severe weather event, damages to your roofing system may become very obvious in the form of saturated walls, drips, or even streams of water cascading to the floor. Hailstorms, hurricanes, and tornadoes in particular can beat up your roofing system, causing severe structural damages, such that extensive repairs or even roof replacement may be necessary. However, sometimes a severe weather event isn’t necessary to expose an emergency situation. 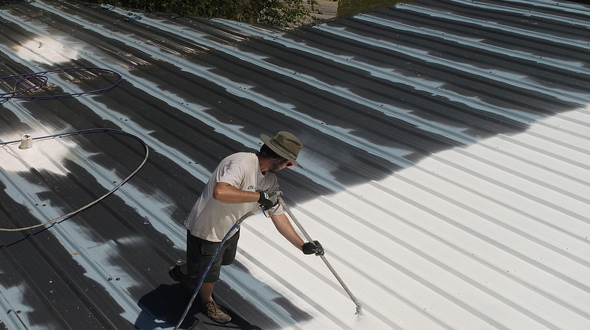 Over time, your roof must frequently endure extreme temperature fluctuations, and eventually, all it takes is a rain shower on a mid-summer afternoon to rapidly cool a nearly 200-degree roof and presto! You’ve got leaks and an emergency on your hands. If your roof damage emergency is the result of an act of God, before any major work begins, you must file the insurance claim. To do so, gather your policy number(s), facts about the situation, and call your insurance carrier to request an assessment. • What is the extent of the damage? • How much material is needed for repairs? 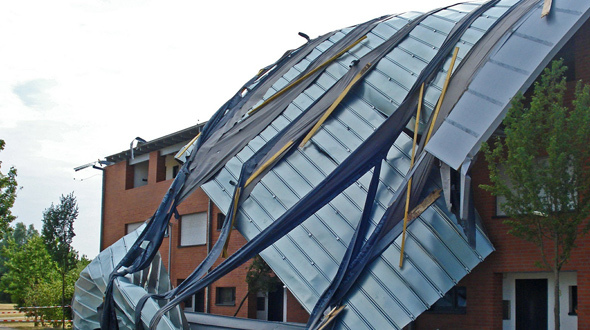 • Was the roof damaged sufficiently to declare it a total loss? • How much material is required for replacement? To ensure that you will receive the maximum benefit from your insurance policy, call a professional roofing contractor to have your own independent assessment done. Request a Reinspection – If you find discrepancies between the insurance adjuster’s findings and those of the roofing contractor, you have the right to request a reinspection or contract an insurance public adjuster. Reinspections are common practice, in which the insurance adjuster will meet with the roofing contractor to review the damages done to your roof. Upon approval of the claim to repair or replace your roof, your insurance provider may select the roofing contractor to complete the work. They may also leave that determination up to you. Note: In areas where a disaster has occurred, insurance companies may set up and follow special temporary procedures to expedite repairs and rebuilding. In these scenarios, it is important to keep receipts and records for temporary repairs, as the insurance company will likely reimburse you. Natural disasters and severe weather events tend to attract some of the worst characters in the roofing business that prey on unsuspecting property owners who are under pressure to get things back to normal. Replacing the roof of a building is a significant investment that needs to be done right, by a contractor that can be fully vetted and held accountable for the quality of their work. When fielding bids from contractors to repair or replace your roof, consider the following factors into the decision-making process. • A valid business license? • A permanent business location? • In-depth knowledge and understanding of your roofing system? • Material and installation warranties? • An effective safety training program? • Proof of continuous training. • Industry awards and recognition. • Good and bad press or reviews. • Provide a seemingly unrealistic high or low bid. • Only provides out-of-state references. • Request money before any on-site material delivery. • Only deal in cash. • Cannot verify their company information and statements. A fast way to address all of the above is to request a “Roofing Contractor Qualification Statement.” This document collects in-depth company information, references, history, and financial stability neatly organized to facilitate your evaluation of that company. The weather and harsh conditions a commercial roofing system must endure dramatically influences its lifespan and necessity for repairs. When the need arises, and it eventually may, you should be prepared to quickly file a claim and call in a professional roofing contractor. With the above information, you can now identify an emergency roofing situation, effectively work with your insurance company, and thoroughly vet the contractors bidding for your job. Without your prompt action, your commercial building will suffer significant losses or temporary closure when severe weather leaves your roofing system vulnerable, damaged, destroyed, and leaking.